On Sept. 8 and Oct. 1, 2018, Iran launched major missile strikes targeting its adversaries in both Iraqi Kurdistan and Syria in the most significant series of missile strikes the country has undertaken in almost two decades. The October strike targeted Islamic State militants near the eastern Syrian border town of Abu Kamal. It followed a terrorist attack on an Iranian Islamic Revolutionary Guard Corps parade in the city of Ahvaz on Sept. 22. The attack killed 29 IRGC members, regular Iranian soldiers and even some civilian onlookers. The IRGC fired long-range Zulfiqar missiles and Qiam-1 missiles at the ISIS targets. It’s unclear how many ISIS members or civilians the missiles ultimately killed and wounded. The September strike targeted Iranian Kurdish dissident groups based in Iraqi Kurdistan. The missiles hit a headquarters belonging to the group in the Iraqi Kurdish town of Koya, killing at least 17 and wounding scores of people, including women and children. The IRGC fired six Fateh-110 missiles at the target. The Koya attack came after renewed clashes between Iranian Kurdish insurgents and the IRGC in Iran’s volatile western frontier provinces. Before this, the only Iranian missile strike targeting against Tehran’s enemies this decade happened on June 18, 2017. That strike targeted ISIS in Deir Ez Zor province following an attack by that group on Iran’s Majlis parliament in Tehran earlier the same month. As with the more recent Abu Kamal strike, the IRGC used Zulfiqars — which are a longer-range variant of the Fateh-110s — and Qiam-1s. Before that the last major Iranian missile strike targeting adversaries beyond its borders transpired in April 2001 — a strike that targeted camps belonging to the People’s Mujahedin of Iran militant group across Iraq and used far older Iranian Scuds and Shahab missiles than these recent attacks. That strike followed a series of Iranian missile launches targeting militants in Iraq throughout the 1990s. Iran’s recent use of missiles in combat underscored some shortcomings. Iranian missiles went off course more than once during these strikes. Footage from the October attack showed two of the Qiam-1 missiles crashing inside Iran, which means at least one-third of the strike package didn’t make it near its targets. Following the June 2017 strike, photographs appeared of missile wreckage in Iraq, hundreds of miles from their intended target. More broadly, the attacks demonstrated the headway Iran has made in missile production over the last few decades. The Shah’s military had an enormous and modern air force for its time, but lacked ballistic missiles. His Islamic Republic successor has since made significant headway in both acquiring and producing ballistic missiles. 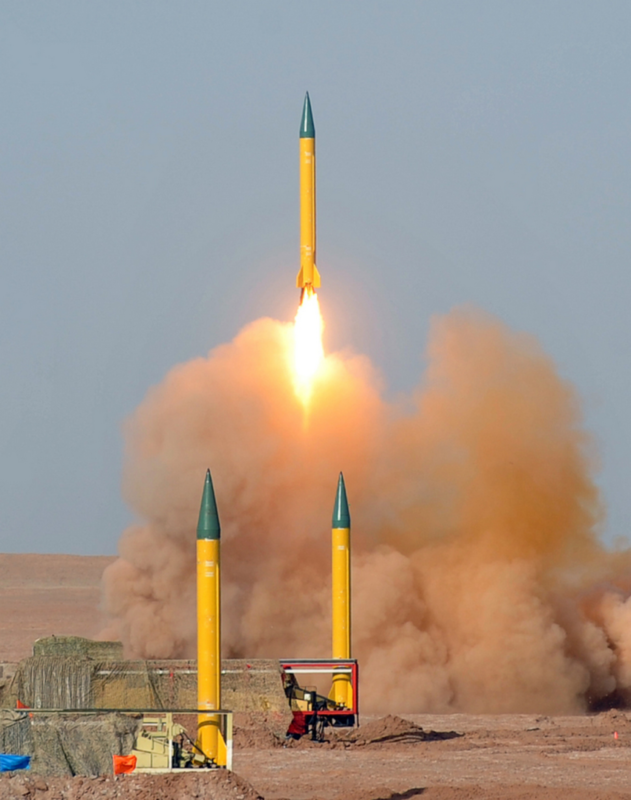 The IRGC has long favored missile development over modernizing the conventional military. In 2015 IRGC rivalry with the conventional Iranian military dashed Tehran’s opportunity to upgrade its air force with 30 sophisticated, Russian-made Su-30 Flanker air superiority jet fighters and the regular army with 300 T-90 main battle tanks, also from Russia. The IRGC gave its own small fleet of Su-25 Frogfoot ground-attack planes to Iraq in August 2014 in order to help Baghdad combat ISIS. Today its air force consists of around a dozen Su-22 Fitter attack planes, which it overhauled in July 2018. While ballistic missile development is a notable achievement, it’s arguable that Iran’s own air force could have done the job in Kurdistan. F-4 Phantom II jet-fighter bombers that Iran has possessed since the 1960s and ’70s could just as efficiently destroyed fixed, defenseless targets. For Iran’s last strike on Syria on Oct. 1, which struck just three miles from U.S. troops, using ballistic missiles made sense, as U.S. warplanes have swiftly downed Iranian drones and Syrian planes violating the nearby air space.